Heroes of Kalevala (4/5 stars, all ages) is today’s Amazon Free App of the Day, and I can personally recommend it. I’ve been a fan of tile-matching games since Bejeweled first came on the scene nearly a decade ago, so I’m pretty knowledgeable and experienced with various versions of this casual game format. I decided to give Heroes of Kalevala a try myself, and it quickly became one of my favorites! A couple of reviewers said the game would not load at all on their devices, but it loaded just fine, even on my Fire HD 7″ (2013 model). One reviewer says there was language inappropriate for children so the app shouldn’t be rated for all ages, but I’ve found nothing objectionable and can’t even imagine how any coarse language would fit into the game. In this game, the premise is that you’re the leader of a tribe that’s been forced to relocate. You earn the money needed to build and maintain a new village by solving match-3 puzzle levels. The more your village grows and the happier the villagers, the more bonus points you earn toward more purchases. 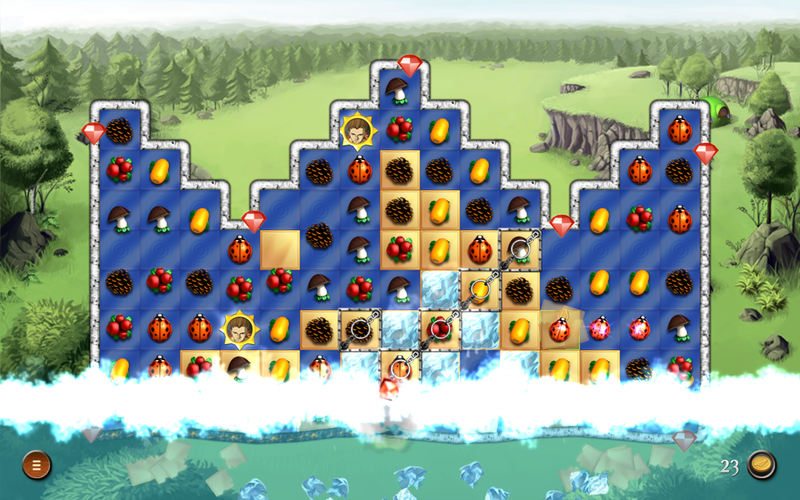 Like many other match-3 games, Heroes of Kalevala has power-ups you can earn by matching 4 or more tiles at a time, but it has the added dimension of power-ups that can only be unlocked by matching power-up tiles on the game board. This is both good and bad, because the presence of power-up tiles means there are fewer of the other tiles available to match. Also like other match-3s, Heroes of Kalevala has a time limit on levels. But the time limit aspect is integrated into the storyline: an evil witch’s pet crow burns the border around the matching field as you go, and you must complete the level before he succeeds in burning the entire border. You can temporarily “stun” the crow, adding more time to your limit, by matching tiles near him. This game has the same kind of ‘locked’ tiles that must be matched multiple times to be unlocked as other match-3s, but there’s a lot more variety to them here than I’ve seen in other match-3 games. Some are chained, some are frozen in ice and are unfrozen by making a match next to them, and as the game progresses other hazards are introduced to the game board as well. 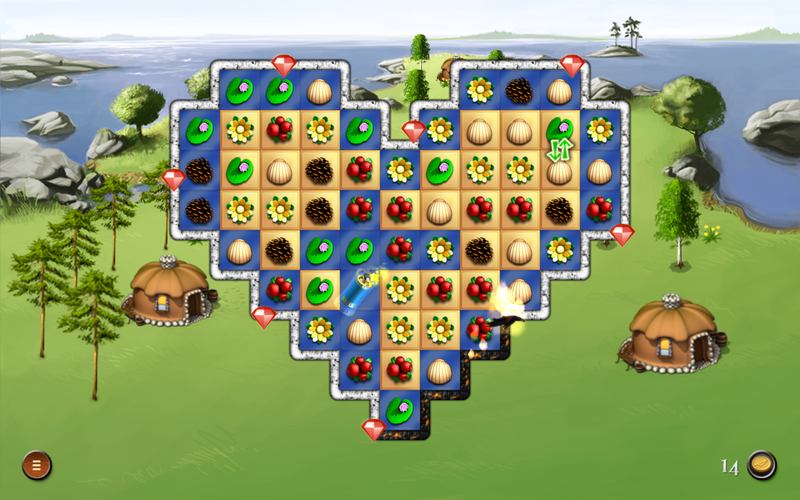 Game boards in Heroes of Kalevala are not simple rectangles or squares, and this adds to the challenge as well. Sometimes you have to think ahead a few moves to ensure the tiles you need to match in a hard-to-reach spot will line up. I rate this game 5/5 stars, based on the levels I’ve played so far. Since it’s free today, why not download it and give it a try for yourself? 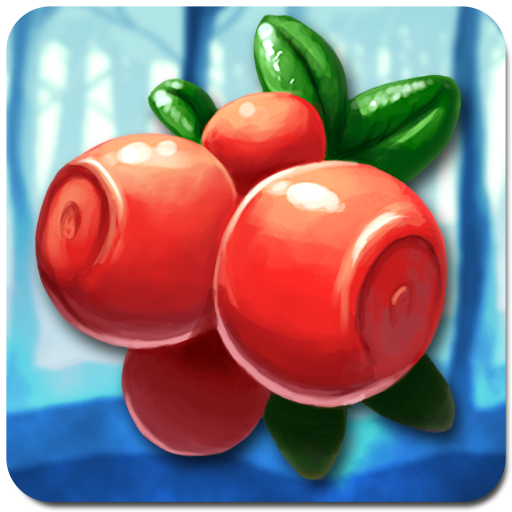 The post Heroes of Kalevala Match 3 Game Is The FreeApp Of The Day appeared first on Kindle Fire on Kindle Nation Daily.